Kwiktop, Locking Your Precious Liquids Away | OhGizmo! Say you live in a dorm. Your buddies are always finishing your Tequila while you’re passed out and you’ve just about had enough of not being able to get plastered properly again the next day. Get the Kwiktop. 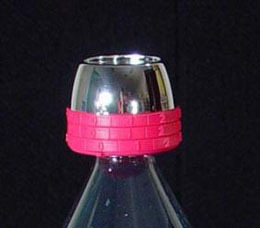 It’s a simple combination lock that will fit just about any bottle and prevent, uh, tampering. There’s two models, one for plastic and one for glass bottles. Now, when I say get the Kwiktop, I don’t mean that literally. The company is actively seeking retail, distribution and licensing partnerships worldwide. So, it might be a bit before you can get your hands on one. Nevertheless, here’s the website. Story VIA Unwirednews, VIA Gizmag. P.S. You might also be interested in a lock for your ice cream. As a parent with three kids…this is a good idea if you still have Jose Cuervo visiting your house. I want to know that when it will be available for sell and I am interested to market this.